Justice Janine P. Geske, Distinguished Professor of Law at Marquette Law School, received the Faithful Servant Award from the Milwaukee chapter of the St. Thomas More Lawyers Society at its annual Red Mass dinner on October 10. The Faithful Servant Award is given to recognize a person “who, in the course of religious, legal, community, public or human services, has exemplified in outstanding fashion the commitments and steadfast dedication of Thomas More, first to Almighty God, and to family life, statesmanship, and the law.” Presenting the award was the Honorable Diane Sykes. 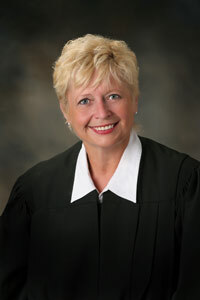 Judge Sykes praised Professor Geske’s lifetime of service to the legal profession. In her remarks upon receiving the award, Professor Geske discussed her work in developing the Restorative Justice Initiative at Marquette. Restorative justice is a method of dialogue between victims and offenders that provides a healing process for victims and offenders, as well as their communities. Professor Geske described the profound impact restorative justice has on everyone involved in a victim/offender dialogue: victims, offenders, and outside observers (who are often law students). She said “I love having the opportunity to expose our law students, who are future lawyers, to a process that calls everyone to listen deeply to others and then to find a way towards healing, even when that journey may be challenging and difficult.” Professor Geske has blogged about the Restorative Justice Initiative here, here, and here. Janine Geske is certainly deserving of this award. Congratulations to her for it. We are lucky to have her in Milwaukee doing good things for our community. Congratulations Janine. I can’t think of a better person for this award. Your service to your community has been extraordinary. Congratulations dear Janine! Sorry for the belated wishes; I’m new to this site. High probability that we shall meet again in 2014! So … à bientôt! Next Next post: No, But I Know Scott Walker . . . .